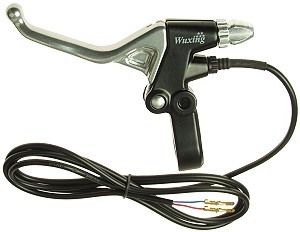 Browse for brake levers by vehicle make and model. Left hand two finger pull brake lever. Built-in brake switch with 63" long cable. High-profile design reaches over handlebar grips and controls. Lever has return spring. Brake switch is normally open. Fits all electric scooter and bike handlebars. 2.8 mm female terminals for white wire connectors. Left hand two finger pull brake lever. 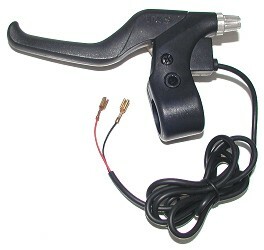 Built-in brake switch with 50" long cable. High-profile design reaches over handlebar grips and controls. Lever has return spring. Brake switch is normally open. Fits all electric scooter and bike handlebars. 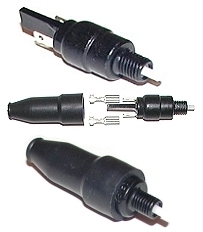 2.8mm female terminals for white wire connectors. Left hand two finger pull brake lever. 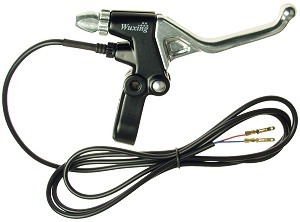 Built-in brake switch with 47" long cable. High-profile design reaches over handlebar grips and controls. Lever has return spring. Brake switch is normally open. Fits all electric scooter and bike handlebars. 2.8mm female terminals for white wire connectors. Left hand three finger pull brake lever. Built-in brake switch with 48" long cable. Lever has return spring. High-profile design reaches over handlebar grips and controls. Brake switch is normally open. Fits all electric scooter and bike handlebars. 2.8mm male terminals for white wire connectors. Right hand three finger pull brake lever. Built-in brake switch with 60" long cable. Lever has return spring. High-profile design reaches over handlebar grips and controls. Brake switch is normally open. Fits all electric scooter and bike handlebars. 2.8mm male terminals for white wire connectors. 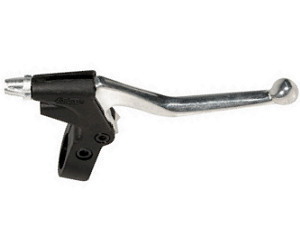 Premium all aluminum left hand three finger pull brake lever. Built-in brake switch with 70" long cable. High-profile design reaches over handlebar grips and controls. Brake lever has return spring. Brake switch is normally open. Fits all electric scooter and bike handlebars. 2.8mm male terminals for white wire connectors. 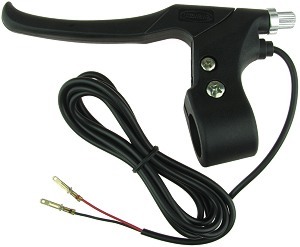 Premium all aluminum right hand three finger pull brake lever. Built-in brake switch with 70" long cable. High-profile design reaches over handlebar grips and controls. Brake lever has return spring. Brake switch is normally open. Fits all electric scooter and bike handlebars. 2.8mm male terminals for white wire connectors. 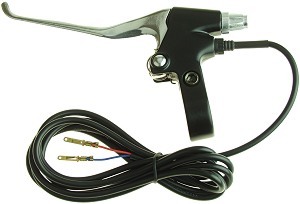 Premium all aluminum left hand three finger pull brake lever. Built-in brake switch with 70" long cable. High-profile design reaches over handlebar grips and controls. Brake lever has return spring. Brake switch is normally open. Fits all electric scooter and bike handlebars. 2-terminal 2.8mm male connector housing with female terminals. 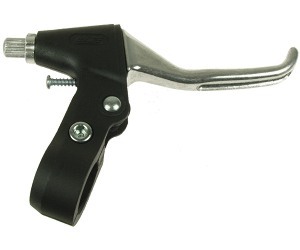 Premium all aluminum right hand three finger pull brake lever. Built-in brake switch with 70" long cable. High-profile design reaches over handlebar grips and controls. Brake lever has return spring. Brake switch is normally open. Fits all electric scooter and bike handlebars. 2-terminal 2.8mm male connector housing with female terminals. Left hand three finger pull brake lever. 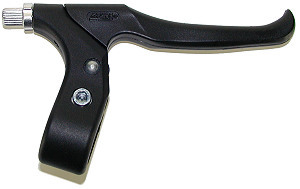 Aluminum lever with plastic base. Built-in brake switch with 65" long cable. Lever has return spring. High-profile design reaches over handlebar grips and controls. Brake switch is normally open. Fits all electric scooter and bike handlebars. 2.8mm male terminals for white wire connectors. Right hand three finger pull brake lever. 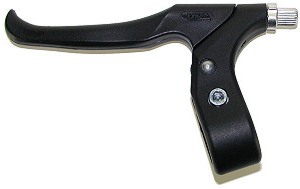 Aluminum lever with plastic base. Built-in brake switch with 65" long cable. Lever has return spring. High-profile design reaches over handlebar grips and controls. Brake switch is normally open. Fits all electric scooter and bike handlebars. 2.8mm male terminals for white wire connectors. 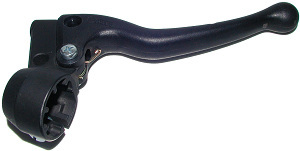 Left hand four finger pull brake lever. 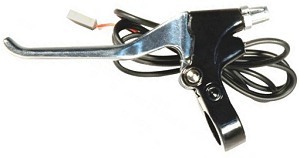 Built-in brake switch with 16" long cable. All aluminum construction. Threaded mirror mounting hole. Lever has return spring. High-profile design reaches over handlebar grips and controls. Brake switch is normally open. Fits all electric scooter and bike handlebars however this lever is typically used on larger street legal electric scooters, bikes and mopeds. 2.8mm male terminals for white wire connectors. Right hand four finger pull brake lever. 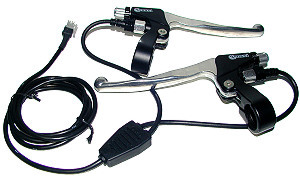 Built-in brake switch with 16" long cable. All aluminum construction. Threaded mirror mounting hole. Lever has return spring. High-profile design reaches over handlebar grips and controls. Brake switch is normally open. Fits all electric scooter and bike handlebars however this lever is typically used on larger street legal electric scooters, bikes and mopeds. 2.8mm male terminals for white wire connectors. Left hand three finger pull brake lever. 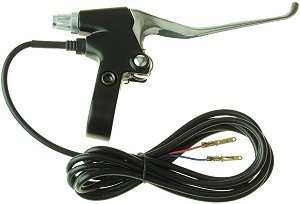 Built-in brake switch with 68" long cable and 2-pin white connector. Lever has return spring. High-profile design reaches over handlebar grips and controls. Brake switch is normally open. Fits all electric scooter and bike handlebars. 2-terminal 2.8mm male connector housing with female terminals. 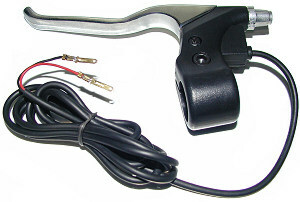 Aluminum brake lever for the eZip® E-450 electric scooter. 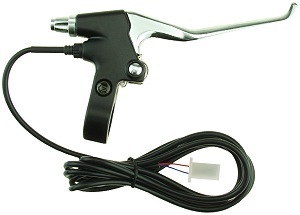 Built-in brake switch with 44" long cable and 2-pin white connector. Lever has return spring. High-profile design reaches over handlebar grips and controls. Brake switch is normally open. Fits all electric scooter and bike handlebars. 2-terminal 2.8mm male connector housing with female terminals. 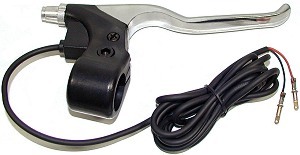 Left hand brake lever for the Pulse® electric scooters. Brake switch is normally open. 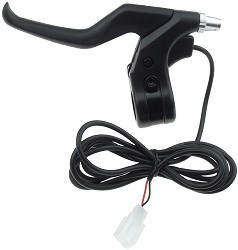 Left hand three finger pull brake lever with brake switch and cord for eZip® and IZIP® electric bicycles. 53" long cable. Brake switch is normally open. 2-terminal 2.8mm male connector housing with female terminals. 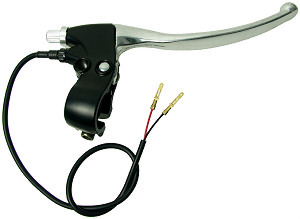 Polished aluminum three finger pull brake lever with built-in return spring. 70" brake switch wires with single connector. High-profile design reaches over handlebar grips and controls. Designed for eZip®, IZIP®, and Schwinn® 1000 series electric scooters. Brake switches are normally open. 2-terminal 2.8mm male connector housing with female terminals. 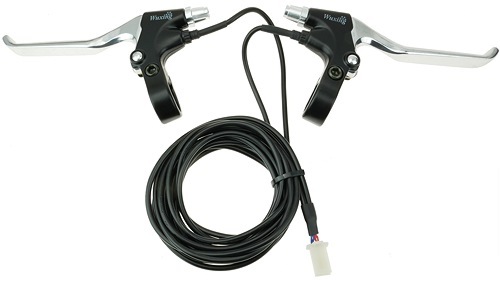 Polished aluminum three finger pull brake lever set with built-in parking brake and brake switches for electric bicycles. Designed for eZip® and IZIP® electric scooters and bicycles. Brake switches are normally open. 2-terminal 2.8mm male connector housing with female terminals. 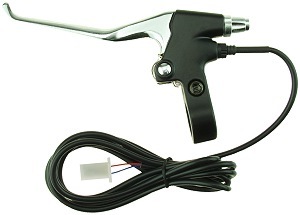 Polished aluminum three finger pull brake lever with built-in return spring. Replaceable brake switches with 60" unified wiring harness. High-profile design reaches over handlebar grips and controls. Designed for Lashout®, Synergy®, Rayos®, and older pre-2005 Currie® electric scooters and bicycles. Brake switches are normally open. 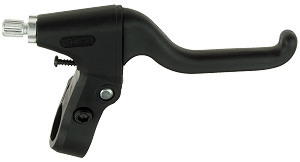 Magura® right hand three finger pull brake lever. Anodized aluminum body with plastic handle. Built-in return spring. 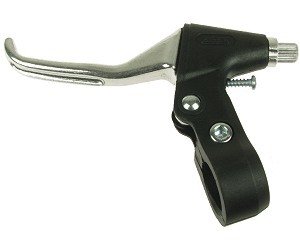 Threaded mounting hole for Magura® brake lever switch sold below. 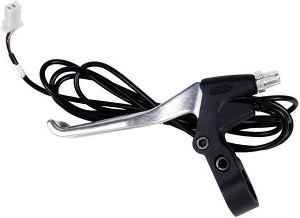 Fits Magura® brake lever sold above. Enclosed weather-proof anodized aluminum switch with rubber boot. Normally open switch contacts. 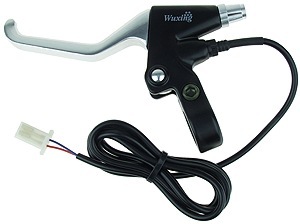 Includes wire connectors..
Left hand three finger pull brake lever. Built-in brake switch with 65" long cable. Lever has return spring. High-profile design reaches over handlebar grips and controls. Brake switch is normally closed. Fits all electric scooter and bike handlebars. 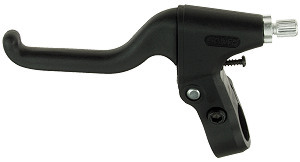 Right hand three finger pull brake lever for eZip® and IZIP® electric bicycles. 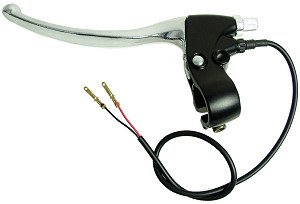 OEM eZip® and IZIP® brake lever. 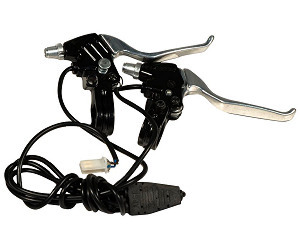 Right hand three finger pull brake lever with built-in return spring. High-profile design reaches over handlebar grips and controls. 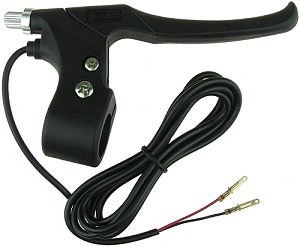 Left hand three finger pull brake lever with built-in return spring. High-profile design reaches over handlebar grips and controls. 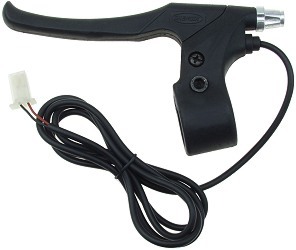 Right hand two finger pull brake lever with built-in return spring. High-profile design reaches over handlebar grips and controls. 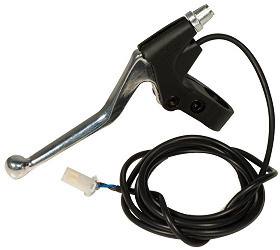 Left hand two finger pull brake lever with built-in return spring. High-profile design reaches over handlebar grips and controls.